The calcium test measures the calcium blood level. What is a calcium blood test? The calcium blood test measures the calcium blood level. Why is a calcium test important? 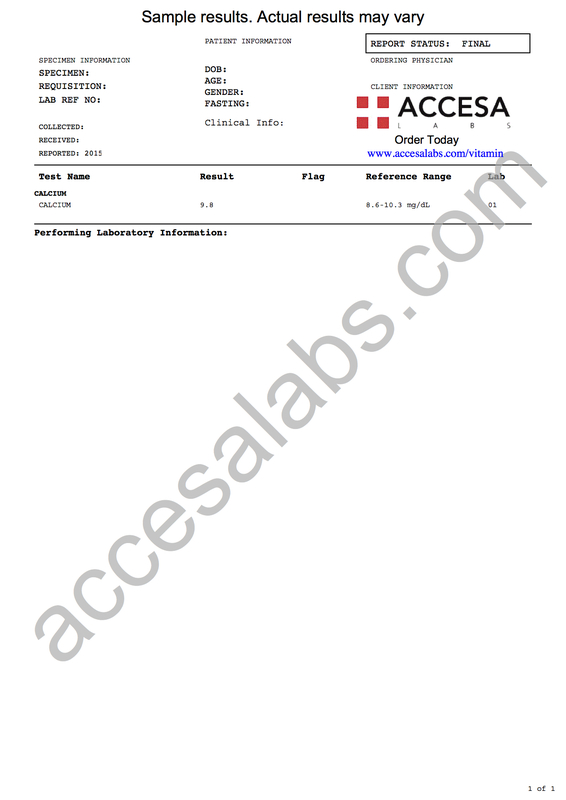 This calcium lab test helps screen for abnormal calcium levels. This Calcium Test is a blood test. The calcium test, also known as a calcium blood test, calciumn level test, and calcium lab test, measures the serum calcium blood level. Calcium is an important element that is primarily stored in bone and calcified cartilage in humans and has many important roles in the body. Calcium is probably best known for its role as a building block of bones which enables the structural support of all of the organs through the skeleton. Calcium also has other roles and is vital for muscle contraction. In this capacity, calcium binds to proteins in the muscle to enable the muscle to contract. In blood vessels, calcium typically causes relaxation - a process which can be impaired in people with chronic medical conditions like high blood pressure and diabetes. Calcium also plays a role in proper nerve impulse propagation. More specifically, calcium is a chemical messenger that enables signals to be transmitted through nerves more effectively. Because it is involved with so many processes in the body, an abnormal calcium level can cause a variety of symptoms. Calcium is primarily absorbed in our diets from dairy, grains and green leafy vegetables. Once absorbed by the intestines, calcium levels in the blood are regulated closely by various hormones and proteins. Vitamin D, in its active form Vitamin D3, increases the absorption of calcium in the intestines and may also participate in breaking down bone to increase blood calcium levels which is why calcium testing is often done at the same time as the vitamin D test. Parathyroid hormone, measurable through the PTH test, increases serum calcium levels by breaking down bone matrix, increasing kidney reabsorption and activating vitamin D. In contrast, calcitonin, a polypeptide hormone produced in the thyroid gland, antagonizes the effect of parathyroid hormone. When blood calcitonin levels are elevated, it works to interfere with the bone breakdown process and it also blocks calcium reabsorption in the kidneys. Calcitonin testing can also help identify reasons for abnormal calcium levels. This particular calcium blood test measures the total calcium level which includes both bound and unbound calcium to give an overall picture of total body calcium stores. To get a calcium test near you, order online and get tested at your selected Quest Diagnostics lab. Once the calcium lab report is ready, it will be available for download. As can be seen on the sample calcium lab results, calcium blood levels will be reported as a numerical result. This calcium test is sometimes performed at the same time as the phosphorus blood test. Calcium Test at Guaranteed Prices.